Robots have many attributes that can aid the modern surgeon. Although humans are clearly superior to robots with regard to clinical judgment, decision making, and flexibility, robots offer precision, stamina, strength, lack of tremor, and reproducibility. This has led to a role for robots in a variety of surgical tasks including instrument positioning, trajectory planning, cutting, drilling, and milling. Robotic surgery also offers the well-described benefits of minimally invasive surgery and laparoscopy. Like conventional laparoscopy, the incisions used during robotic surgery are smaller. This translates clinically to quicker convalescence, shorter hospital stays, diminished postoperative pain, and narcotic requirements, as well as a diminished risk of infections and better cosmesis (2,3). However, conventional laparoscopy has several limitations. These are largely technical and mechanical issues, stemming from the nature of standard laparoscopic equipment. The standard endoscope forces the surgeon to work looking at a video monitor instead of looking at his/her hands, thus disturbing the surgeon's hand-eye coordination. 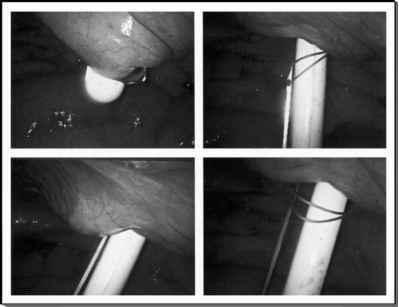 Conventional endoscopes use two-dimensional vision, thus limiting the depth of perception of normal binocular vision. In addition, there is loss of haptic feedback, referring to both the force feedback and tactile feedback used routinely in open surgery. Decreased haptic feedback makes tissue manipulation heavily dependent on visual feedback. Laparoscopic instruments work through ports placed within the body wall. With the port acting as a pivot, the direction of the instrument tip is reversed from that of the instrument handle, leading to counterintuitive motion. This also leads to a compromise in dexterity because the port at the body wall constrains the motion of the instrument in two directions. The result is that the tip of the conventional laparoscopic instrument has only four degrees of freedom, in contrast to the human hand having seven degrees of freedom. Finally, physiological tremors of the surgeon's hands are transmitted through the length of rigid instruments. These limitations make delicate dissection and the creation of complex anastomoses very challenging to the conventional laparoscopist. Overcoming the disadvantages inherent to conventional laparoscopy, and expanding the benefits of minimally invasive surgery are major aims of surgical robotics. Although not yet commonplace, robots are revolutionizing surgery, and urology is no exception. In fact, urologists have been leaders in the development and application of surgical robotics.